» How to optimize your forum pictures? The Tawny Owl (Strix aluco) is a stocky, medium-sized owl commonly found in woodlands across much of Eurasia. Its underparts are pale with dark streaks, and the upperparts are either brown or grey. Several of the eleven recognised subspecies have both variants. The nest is typically in a tree hole where it can protect its eggs and young against potential predators. This owl is non-migratory and highly territorial. Many young birds starve if they cannot find a vacant territory once parental care ceases. This nocturnal bird of prey hunts mainly rodents, usually by dropping from a perch to seize its prey, which it swallows whole; in more urban areas its diet includes a higher proportion of birds. Vision and hearing adaptations and silent flight aid its night hunting. 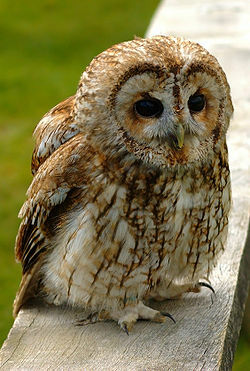 The Tawny is capable of catching smaller owls, but is itself vulnerable to the Eagle Owl or Northern Goshawk. Red Foxes are an important cause of mortality in newly fledged young. Although many people believe this owl has exceptional night vision, its retina is no more sensitive than a human's. Rather, it is its asymmetrically placed ears that are key to its hunting because they give the Tawny Owl excellent directional hearing. Its nocturnal habits and eerie, easily imitated call, have led to a mythical association of the Tawny with bad luck and death. 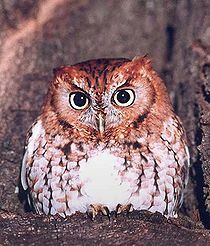 Screech-owls are typical owls (Strigidae) belonging to the genus Megascops. Twenty-one living species are known at present, but new ones are frequently recognized and unknown ones are still being discovered on a regular basis, especially in the Andes. For most of the 20th century, this genus was merged with the Old World scops-owls in Otus, but nowadays it is again considered separate based on a range of behavioral, biogeographical, morphological and DNA sequence data. Screech-owls are restricted to the Americas. Some species formerly placed with them are nowadays considered more distinct. See below for details. The common name "screech-owl" is sometimes used for the not closely related Barn Owl as well. The Snowy Owl (Bubo scandiacus) is a large owl of the typical owl family Strigidae. The Snowy Owl was first classified in 1758 by Carolus Linnaeus, the Swedish naturalist who developed binomial nomenclature to classify and organize plants and animals. 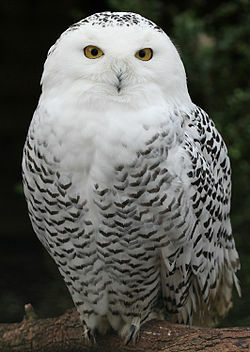 The bird is also known in North America as the Arctic Owl, Great White Owl or Harfang. Until recently, it was regarded as the sole member of a distinct genus, as Nyctea scandiaca, but mtDNA cytochrome b sequence data (Olsen et al. 2002) shows that it is very closely related to the horned owls in the genus Bubo. The Snowy Owl is the official bird of Quebec.